Apple I computer, created April 11, 1976. 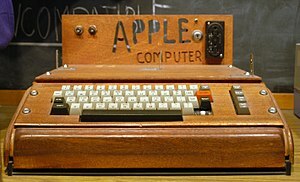 The Apple I Computer was Apple’s first product. It was designed and hand-built by Steve Wozniak, and sold by his friend Steve Jobs. Woz and Jobs initially built 50 computers and sold them at a local computer store for $666.66 each. They sold every one. In total, about 200 Apple I Computers were built, but they quickly became obsolete. Inspired by their success, Woz designed the Apple II less than a year later, and it went on to become one of the great computer successes of all time. The Apple I still fares pretty well, though. In November 2010, an Apple I sold for $212,267 at Christie’s auction house in London. It is the highest price paid for this model so far. The first is good, I find, because it reminds us that we’re doing what we’re doing because it’s what we want to do (maybe even need to do), and that it won’t necessarily match up with the instructions or the focus groups or the classes. The second is very freeing, I find, because, after all, the “risks” are very small, in the big picture.